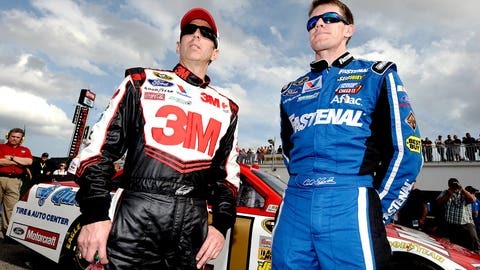 Greg Biffle (left) and Carl Edwards (right) are looking for more speed in the upcoming NASCAR Sprint Cup Series season. When Carl Edwards won the final race of the 2013 NASCAR Sprint Cup regular season at Richmond International Raceway in early September, he appeared ready to make a serious run at the championship. Edwards won two of the first 26 races of 2013 and actually ended up as the regular season points leader, narrowly edging out Jimmie Johnson. But unfortunately, when NASCAR’s playoff round arrived, the wheels quickly came off for Edwards and his Roush Fenway Racing team. After opening the Chase for the Sprint Cup with finishes of 11th at Chicagoland Speedway and ninth at New Hampshire Motor Speedway, a rare wheel hub failure at Dover International Speedway left Edwards 35th in the race. Add in an engine failure at Texas Motor Speedway and a string of mediocre runs and Edwards ended the year a hugely disappointing 13th in points, last among the Chase drivers. His teammate, Greg Biffle, didn’t do a whole lot better. Although Biffle finished third at New Hampshire, the best he did in the other Chase races was a pair of ninth-place runs at Dover and Martinsville Speedway. Biffle failed to crack the top 10 in his other seven Chase races, ending the year ninth in points. And while the third Roush Fenway driver, Ricky Stenhouse Jr., managed to capture NASCAR Sprint Cup Rookie of the Year honors, he didn.t make the Chase and had just one top-five and three top-10 finishes all year long. Although Stenhouse showed a lot of potential long-term upside, for his rookie season at least, he was a clear step behind the man he replaced the No. 17, Matt Kenseth, who ended up winning seven times with Joe Gibbs Racing. It might sound simplistic to say, but the simple truth is that for most of the season — and especially in the Chase — the Roush Fenway Fords weren’t as fast as the Hendrick Motorsports Chevrolets or the Joe Gibbs Racing Toyotas. They weren’t off by much, but in such a fiercely competitive sport as NASCAR, being behind a little actually is being behind a lot. "We didn’t have enough speed," added Biffle, bluntly. "We weren”t competitive enough." And that did not sit well with him. "You want to throw the helmet down, you want to kick the door," said Biffle. "It’s like, I want to finish in the top five. I want to be competing for the win, I want to lead laps. I don’t want to fight tooth and nail for 13th or 15th. And that’s frustrating. But you’ve got to keep your head up, you’ve got to work hard and you have to come back the next week and say, "What can we do to be better?" Interestingly, with a new set of aerodynamic regulations looming for 2014, the Roush Fenway drivers think that could up them make up ground to Hendrick and Gibbs. "Let’s be honest, from our perspective, we don’t have a lot to lose," said Edwards. "We’re all for shaking things up because at Roush Fenway Racing, we have a pretty good ability to adapt. The problem is, it could be really expensive, it could be a lot of work and we really don’t know the outcome. I.m curious to see whatâs going to happen." Interestingly, Kenseth said he left Roush Fenway Racing in part because he didn’t see any improvement within the team looming on the horizon. "We did good, but it was kind of a different variation of the same season," said Kenseth. "If we had a good year we could win between one and three races and we could make the Chase but we were never a serious contender to win the championship and I felt like that’s all I could give, that’s all I could get. … I just think after you’re somewhere for a really long time and the same basic people are running it, it’s the same basic system, we go about things the same basic way and we had basically some variation of the same results last seven or eight years, after a while you’re maybe not — it’s not that your voice isn’t heard or whatever, but it’s probably not or doesn’t carry as much weight or they don’t look to you as much or whatever, I think, after you’ve been there that long." Can Roush Fenway Racing restore the form the team flashed a decade ago when it won Sprint Cup championships in 2003 and ’04 and put a record five cars in the Chase in ‘05? Without doubt, that will be one of many storylines people will be watching closely in 2014.